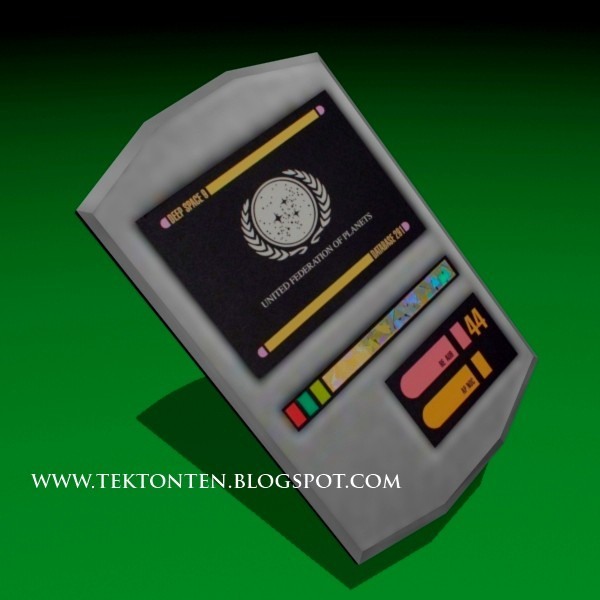 Back in September I revamped the Star Trek: Voyager medical tricorder paper model I released in 2009. Next up on the revamp list is my 2009 PADD papercraft. The original PADD was based on a 3D model from the Star Trek Voyager Elite Force video game. However, after doing some research, I found that the PADD was configured more like a Deep Space Nine PADD than a Voyager PADD. So accordingly I changed the textures to show a DS9 readout. The new template is available here (both A4 and Letter size included). Like the original PADD, the scale of the model is 1:2.
great job! any chance of getting a 1:1 scale template? Possibly. The template will need to be redesigned to add some internal bracing. At 1:1 scale it becomes a little too floppy using the template design for the 1:2 scale model.